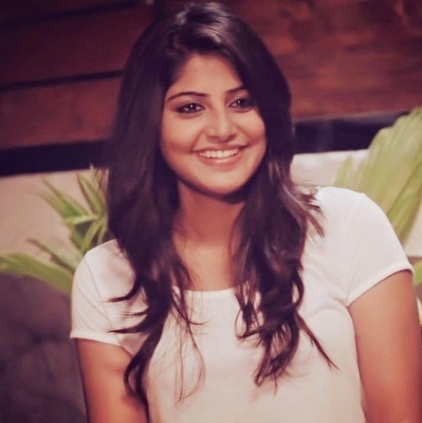 Her first Tamil film Achcham Yenbadhu Madamaiyada (AYM) is ready to hit the marquee tomorrow, the 11th November but Manjima Mohan already features in the list of favorite heroines of K Town. Amidst busy promotions, the gorgeous actress talks to behindwoods about AYM, GVM, Simbu, her role as Leela and much more. After a long wait, we are going to see your debut Tamil film. What are your feelings right now? I am very excited as the film is going to release. But at the same time, I am nervous too. When people are calling me to inquire if the film is going to release, it kind of puts you down, especially when you are tensed. I am trying to cope with it all and remain positive. I am eagerly waiting for it. How close or far off is Leela from Manjima? Gautham sir feels Leela is very similar to me, but I feel she is different. He also was telling me since her characterization is so similar to mine, he cast me in the film. I trust my director, maybe he is right! That said, Leela is very soft but I am not. She is very easy going and gets along with people very fast. You will see that she comes in to the family and gets along with everyone. This is like me. Although I am innately shy, but I get along with people pretty fast. In your opinion, what is AYM’s USP? It’s a Gautham Menon’s film and AR Rahman’s musical. And of course, Simbu is there. People will come to this film mainly because of the return of VTV trio- GVM-ARR-Simbu. I am there in the movie and so people might want to know why Gautham has chosen this girl! You already have a huge fan base here. What do you attribute this to? I am actually thinking. I was so overwhelmed with the response that I get in the press meets and interactions. I am wondering and honestly, I don’t know. I asked Gautham sir and he said- you look like a very relatable girl. I feel it could be because I am Gautham sir’s heroine. Songs may have given the hype and Simbu has also been saying good things about my performance. So probably, people are curious. I only hope I don’t disappoint them. There was a lot of pressure on Gautham sir, because we needed to do justice to the song as it is such a popular number. He planned everything and we went to Bangkok to shoot just for two days. It has come out very well; we saw the visuals and we are all really really happy. I was very sick during the shoot and was sneezing most of the time. Gautham sir and Simbu were very supportive and I managed. Simbu is a talented artist and he can sleepwalk through any role. Your take? He has done an amazing work in AYM and I would say this is going to be an important film for him in his career. It will be a classy comeback and AYM will take him to a different level. He is not a selfish actor. He will come to the sets and be with everyone. He will go to Dan (DoP) and make sure everything is ok; he will go to Gautham sir, give extra inputs; he will come to me and tell that I should try this and will go to Sathish (his friend in the film) and say- machan, ippadi panna nalla irukkum. He will work on all these. Of course, there are factors like his late entry to the sets. But when he is at the sets, it is a different thing. He can charm you outright. You can never get angry with him. Was there any challenging scene that you found it difficult to match up with him? Actually, I felt like that in the entire movie (laughs). But in the second half, there were many intense scenes where both of us had to break down. I remember one scene when we gave our best and after we were done with it, there was an awkward silence at the sets and everyone started clapping. I would never forget that. I can say that I kind of competed with Simbu in that scene. I was like – dude if you are going to do, I can also do- types. It was like a competition but the scene came out well. From your entry into films till now- how do you see yourself? I feel I am more professional now. I am not all that experienced, but now I know why a particular shot is in the way it is. I like to learn a lot. If a director keeps a shot in a specific way, I find out from him about it so that I have clarity. That way, I am learning, but then coming out of Gautham Menon’s sets is like coming out of IIT. I can proudly say I have learnt a lot. I am keeping my fingers crossed. I hope everybody goes to the theatres to watch the film. That way, it is evident that they are appreciating our efforts. They don’t even have to come and tell us that we have done a good job. Please, go to the theatre and watch! People looking for online information on Achcham Yenbadhu Madamaiyada, Gautham Menon, Manjima Mohan, Simbu will find this news story useful.